The PC104P-1553 Interface Card and AltaAPI Represent the Latest MIL-STD-1553 32-bit FPGA Protocol Engine Technology with Multi-Layer Software. Our Card and Software Packages are Designed for Fast, Portable Integrations. The PC104P-1553 is the Only Commercial Off the Shelf (COTS) Card that Passes and Executes the SAE AS4111/4112 Protocol Tests. 1-4 Independent, Dual Redundant 1553 Channels. Commercial or Rugged Ext Temp. 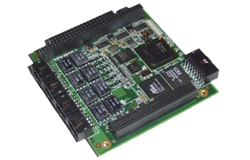 Alta Data Technologies’ PC104P interface module is a multi-channel (1-4) 1553 card supported by the latest software technologies. The PC104P card is based on the industry’s most advanced 32-bit 1553 FPGA protocol engine, AltaCore™, and by a feature-rich application programming interface, AltaAPI™, which is a multi-layer ANSI C and Windows .NET 2.0 (MSVS 2005 C++, C#, VB .NET) architecture. This hardware and software package provides increased system performance and reduces integration time. The PC104P-1553’s BC capability, including variable message framing/subframing with transmission scheduling provides the most advanced BC control operations. RT, Monitor, Playback and Signal Generator functions also include industry leading functions to meet the most demanding requirements. AltaCore is guaranteed 1553B Notice II & IV compliant and is manufactured to the highest IPC-Level 3 standards and certified AS9100 processes. Cards are available in dual-function (BC/Mon or multi-RT/Monitor) or full-function (BC, mRT and Mon) configurations. Playback and Signal Generation are part of BC operations. We are committed to a risk free integration and will be glad to help with any level of your system development. Here you can find documentation pertaining to the PC104P-1553. For additional documentation and software, please visit our secure download area. PC104P-1553-1D PC/104-Plus Interface with One Channel of Dual Redundant MIL-STD-1553 with Dual Function (BC/Mon or mRT/Mon) Capability. Included: AltaAPI Software. PC104P-1553-2D PC/104-Plus Interface with Two Channels of Dual Redundant MIL-STD-1553 with Dual Function (BC/Mon or mRT/Mon) Capability. Included: AltaAPI Software. PC104P-1553-3D PC/104-Plus Interface with Three Channels of Dual Redundant MIL-STD-1553 with Dual Function (BC/Mon or mRT/Mon) Capability. Included: AltaAPI Software. PC104P-1553-4D PC/104-Plus Interface with Four Channels of Dual Redundant MIL-STD-1553 with Dual Function (BC/Mon or mRT/Mon) Capability. Included: AltaAPI Software. PC104P-1553-1F PC/104-Plus Interface with One Channel of Dual Redundant MIL-STD-1553 with Full Function (BC/mRT and Mon) Capability. Included: AltaAPI Software. PC104P-1553-2F PC/104-Plus Interface with Two Channels of Dual Redundant MIL-STD-1553 with Full Function (BC/mRT and Mon) Capability. Included: AltaAPI Software. PC104P-1553-3F PC/104-Plus Interface with Three Channels of Dual Redundant MIL-STD-1553 with Full Function (BC/mRT and Mon) Capability. Included: AltaAPI Software. PC104P-1553-4F PC/104-Plus Interface with Four Channels of Dual Redundant MIL-STD-1553 with Full Function (BC/mRT and Mon) Capability. Included: AltaAPI Software.